Chevrolet Volt owners collectively have driven more than 100 million all-electric miles since the vehicle went on sale two years ago this month. The average Volt owner travels more than 65 percent of the time in pure electric mode as the car was designed – only using the gasoline-powered generator for longer trips. 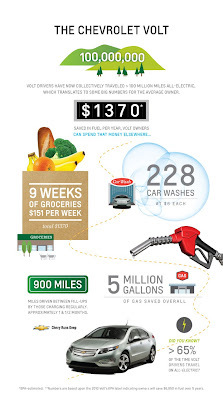 By charging regularly, Volt owners drive approximately 900 miles, or a month and a half, between fill-ups. However, many Volt owners quickly exceed that average, based on an EPA-estimated 98 MPGe that puts electric-only range at 35 mpg city and 40 mpg on the highway. Andrew Byrne from Los Angeles is one of these drivers. 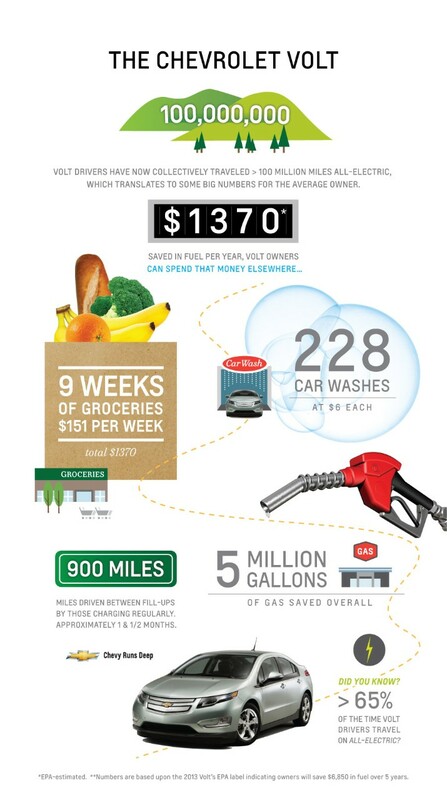 With each avoided trip to the gas station, Volt drivers continue to increase their return on investment. Based on EPA estimates and compared to the average new vehicle sold in the United States, Volt owners are saving about $1,370 a year in fuel costs. This is the second year in a row the Volt has topped the satisfaction survey of one of the leading consumer testing organizations in the United States. The 5 million gallons of gas saved is equivalent to $21 million in gasoline costs averted overall based on $4 per gallon of premium, or more than two supertankers of gas. For the first 38 miles, the Volt can drive gas and tailpipe-emissions free using a full charge of electricity stored in its 16.50-kWh lithium-ion battery. When the Volt’s battery runs low, a gas-powered engine/generator seamlessly operates to extend the driving range another 344 miles on a full tank.